Any fashionable diva, or for that matter, anybody who loves footwear more than the average human, would have heard of the Danish footwear maker ECCO. The company is revered as one of the most significant and successful family run businesses in Scandinavian business space. 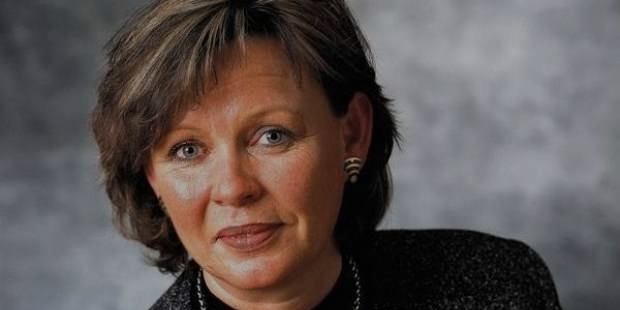 Hanni Toosbuy Kasprzak is the proud owner and chairperson of this super successful firm. Hanni Toosbuy Kasprzak was born to Karl Toosbuy in 1957. Her father was the founder of ECCO. Soon after completing her education, she started working at ECCO. She was 21 years old when she began working and it started out with unofficial daily visits to the factory in Bredebro. She was assigned the task to process the checks from the orders in her early career. Though most people would be sceptical on being involved in menial tasks in a company owned by their family, but Hanni’s success mantra, apparently, is to just go for it, and make things happen. Later on, Hanni was asked by her father to work formally for ECCO in the quality control department. For her first formal assignment she was sent to company’s factory in India, where she got the best exposure of the working of family business. After working at various levels in the family business, eventually, she became the Chairman of the Supervisory Board in 1996. 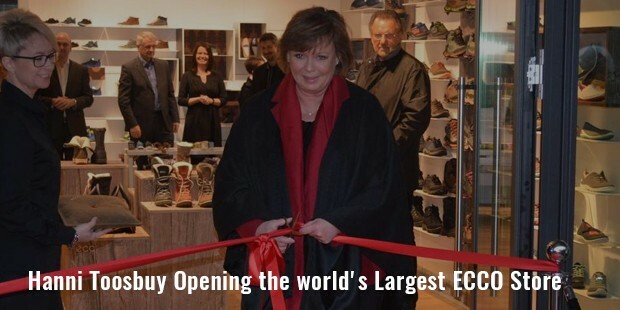 At present, Hanni Toosbuy Kasprzak is the chairman and owner of Danish shoe manufacturing company, ECCO. She got at the helm of affairs after the death of her father.Currently, she heads the whole ECCO group which comprises of ECCO Sko A/S, ECCO Holding, ECCO USA Inc., ECCO Asia Pacific Ltd., ECCO EMEA BV and The Toosbuy Foundation. 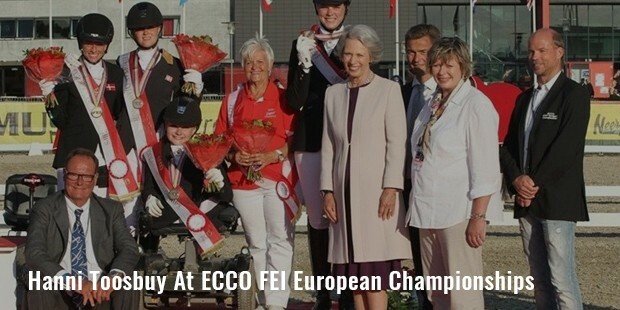 Hanni Kasprzak also met her husband, Dieter Kasprzak, at ECCO. Dieter, at a young age, became an apprentice shoemaker in Germany. He worked for many different shoe brands and became a shoe designer after his initial experiences as a show maker. Hanni met Dieter during her holiday in Denmark, around the time when she was posted in India.The couple have two children, who are in their mid-20s and are professional athletes. Son Andre is a professional golfer and daughter Anna represented Denmark at London Olympics 2012. Hanni Kasprzak respects what her children are doing, but wishes that at least one of them join the family business. Starting from factory level, Hanni devised her way to success by overcoming several odds. At the age of 58, Hanni Kasprzak is the fifth richest person in Denmark with an estimated worth of $2.7 billion, according to Forbes. She holds 690th position in the list of world richest persons, from Forbes. At the 2010 US Masters golf tournament one of the company’s shoes was worn by golfing legend Fred Couples; this is a fair exhibition of the acclaim enjoyed by ECCO. According to Forbes, more than 20 million pair of shoes was sold by ECCO in 2013. The company has presence in 87 countries with a total of 15,000 sales points across the globe. Talking of awards, last year, ECCO won the global shoemaker of the year award in Germany, for the second time. It is one of her career highlights, how she has taken her family’s business to the top of the market, and sustained the supremacy.